Aadhar Card, PAN Card, Voter ID, etc. Valid NEET PG Admit Card and Rank Card. 10th,12th Marksheet and Passing Certificate. Original and 2 photocopy of Transfer certificate. Directorate General of Health Services (DGHS) on behalf of Medical Counselling Committee (MCC) has announced the dates of NEET PG 2019 counselling. The registration is beginning on March 15th 2019. NEET PG 2019 authorities will be conducting the counselling of NEET PG 2019 first round from March 15th to March 25th, 2019. It is for admission to MD/MS and PG Diploma seats. The counselling of NEET PG 2019 for 50% All India Quota seats will be conducted in two rounds. While the counselling for Central & Deemed Universities will be conducted in three rounds. 50 % All India Quota seats for all State Govt. medical/dental colleges/institutes, except state of Jammu and Kashmir as per merit of PG NEET 2019. 50 % institutional quota seats for Central Universities of Delhi University, Aligarh Muslim University, and Banaras Hindu University. All India NEET PG 2019 rank: This is the overall rank or position of the candidate amongst all the candidates who have appeared in the NEET PG 2019 throughout India. All India 50% quota rank: This is the overall merit position of the candidate amongst all the candidates who have appeared in the NEET PG 2019 for All India 50% quota and is valid only for All India 50% quota MD/MS/Post-Graduate Diploma Courses 2019 admission session. All India 50% quota Category Rank : This is the overall merit position of the candidate in the category (Other Backward Classes/Scheduled Caste/Scheduled Tribe) as opted by the candidate in the NEET PG 2019 for All India 50% quota and is valid only for All India 50% quota MD/MS/Post Graduate Diploma Courses 2019 admission session only. State quota/ Private medical colleges/Deemed University/AFMS rank: State quota rank, state category rank, benefit for In-service candidates, rural posting (if applicable) etc shall be determined/generated by the designated agency/authority of the concerned States/university/concerned authority as per applicable Regulation and/or their NEET 2019 Eigibility Criteria, guidelines, and applicable reservation policies. Choice of courses and colleges must be filled by the candidates during the counselling process. The admission of candidates depends upon their preferences, and availability of seats .The following documents must be shown during the counselling time. NEET PG 2019 Admit Card and Rank Card. Admission into Private medical colleges/Deemed University: Counselling for admission to private Medical Colleges, Institutions, Universities & Deemed Universities shall be conducted by the designated counselling authority of these Private Colleges/Institutions/Institutes/Universities/Deemed Universities using NEET PG 2019 scores and as per applicable Regulations and/or their eligibility criteria, reservation policy, etc. Admission into Armed Forces Medical Service Institutions: Counselling for admission to Armed Forces Medical Service Institutions shall be conducted by the Directorate General Armed Forces Medical Services (DGAFMS), Ministry of Defence, Government of India using NEET PG 2019 scores and as per their eligibility criteria, applicable Regulations & guidelines. Admission into DNB Broad Speciality Courses: Centralised merit-based Counselling for admission to DNB Courses shall be conducted by NBE using NEET PG 2019 scores. Counselling will be conducted for All India 50% quota seats. Moreover, NEET PG 2019 Counselling will also be conducted for All India 50% category rank seats. The Results of NEET PG 2019 Counselling Round 1 has been declared. The aspirants are likely to start reporting to the allocated institutes as per schedule. Keeping in view the observance of many holidays, the colleges are directed to keep admission counters open on holidays. This is to ensure that the candidates are not facing any difficulties in admission. At the time of admission, colleges are also instructed to take only the transaction charges (10% of Annual fee) for candidates who have selected for upgradation in the next round. And, in case the candidates get upgraded, the documents should be handed over back to the candidates as early as possible and fees must be refunded if any. In case any alloted candidate is not in a position to bring the Demand Draft (DD) in view of the bank holidays, he/she may be given provisional admission on the basis of post-dated cheque/ Undertaking. This is done to avoid any inconvenience to the candidate. In case of any discrepancy regarding fees/Bond Information etc., the candidates are requested to confirm the same from the college authorities before reporting. This notice was released on 29-03-2018. With respect to certain queries being raised by the candidates regarding exit policy in Round 1, the following points have been given in the official website. And the same can be noted down by the candidates. Candidates who have been allotted any seat under AIQ/Central University, if they do not report or join to the allotted institute will be allotted free exit. That means, aspirants will be reimbursed back with his/her Refundable Tuition Fee as per his eligibility directly to his account in due course of time. However, the candidate will not be eligible for participating in further rounds of counselling. This notice has posted on 29-03-2018. Click on the link which is given above to register online for NEET PG 2019 Counselling. 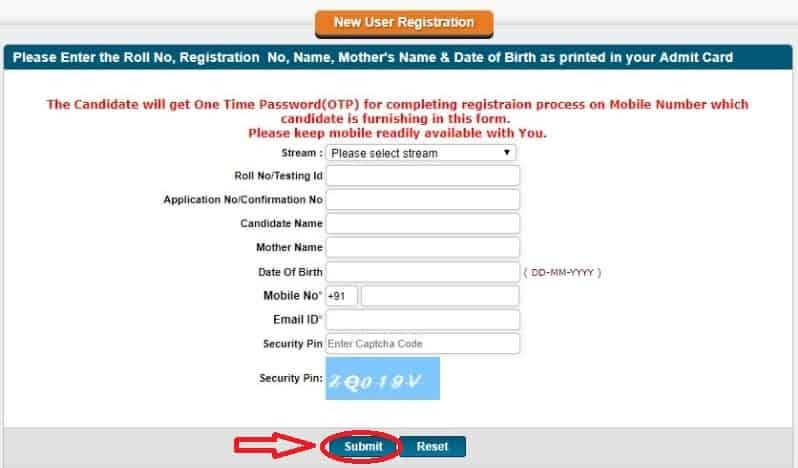 Next, the applicant has to enter details such as Testing ID/Roll Number, Confirmation Number/Application Number/ Candidate Name, parent's Name, Date of Birth, Mobile Number, Email ID, Security pin. Submit the details by clicking on “Submit” button as shown below. Aspirants need to log in by entering the details like their Testing ID/ Roll Number, selecting the stream, Password. Candidates should fill the subjects and institutions/ colleges in choice and in order of preference. Applicants can choose from possible options. The allotment will be done on the basis of choices submitted by the qualified candidate in order of preference. Once the candidate had filled their choices they can lock it. Before locking kindly check twice, if any modifications needed. It is mandatory to get a printout of your submitted options and also candidate must note the choices. If, a candidate does not lock the choice, the submitted choices will be automatically locked on the notified date and time. However, one will be allowed to take a printout of choices but there is no option to change answers. Step 3: Seat Allotment Result. The result of the seat allotment for round 1 has been published online at the MCC official website. The candidates have been allotted seat on their merit in the entrance exam, availability of seat in the respective colleges and choices given by the candidate. Click on the link which is given below to download the Allotment Letter for Round 1. Enter login details like Stream, Round and Roll Number. Download and take its print out to bring it on the day of admission. The NEET PG counselling 2019 for remaining 50% State Quota seats (100% in case of Jammu and Kashmir) in government medical colleges and all the seats of self-financing and private colleges will be conducted by the respective state counselling authorities. The states will be conducting the common centralised counselling for MD/MS/PG Diploma courses. The states will be releasing their own counselling schedule for NEET PG 2019 state counselling. The state merit list will be prepared on the basis of NEET PG merit list 2019. What is the Counselling process for the NEET-PG 2017? Counselling for NEET PG: Students who have qualified the NEET PG with sufficient scores required by the board are the ones who will be called up/ notified for the Counselling Process. Required Documents: Candidates will have to carry the originals and copies of their marks cards, NEET PG 2017 scores and other necessary documents communicated to the Candidate appearing for the Counselling Process. All India 50% quota rank: This is the overall merit position of the candidate amongst all the candidates who have appeared in the NEET-PG 2017 for All India 50% quota and is valid only for All India 50% quota MD/MS/Post Graduate Diploma Courses 2017 admission session. All India 50% quota Category Rank : This is the overall merit position of the candidate in the category (OBC/SC/ST) as opted by the candidate in the NEET –PG 2017 for All India 50% quota and is valid only for All India 50% quota MD/MS/Post Graduate Diploma Courses 2017 admission session only. State quota/ Private medical colleges/Deemed University/AFMS rank: State quota rank, state category rank, benefit for In-service candidates, rural posting(if applicable) etc shall be determined/generated by the designated agency/authority of the concerned States/university/concerned authority as per applicable Regulation and/or their eligibility criteria, guidelines and applicable reservation policies.